It was only a matter of time before an EcoBoost Mustang broke through the 10-second barrier. The odds-on favorite to set this record was Brad Gusler of BG Racing. 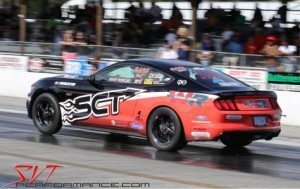 He put the Mustang world on notice back in March of 2015 when he clicked off an 11.19 at 119 mph. It’s taken a lot of work and refining of the combination, but on Wednesday Brad and his Mustang broke into the 10-second zone—three times in a row! 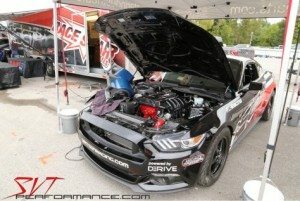 Knowing he would soon approach the limits of the stock engine if he kept pushing the combination with more boost, Brad commissioned Custom Performance Engineering to build a fortified 2.3-liter short-block for his Mustang. Now you might be aware of CP-E’s vast line of EcoBoost bolt-on parts for everything from Fiesta STs to EcoBoost Mustangs, but the company also builds engines. As such, engine builder Mitch Levy created a robust short-block to withstand Brad’s 10-second quest. 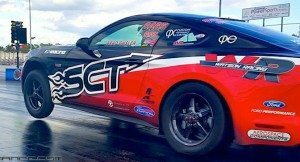 We thought Brad Gusler might re-set the EcoBoost Mustang e.t. 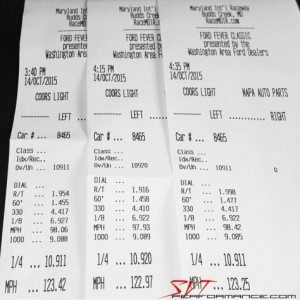 record during the EcoBoost Battle at the NMRA World Finals. That didn’t quite work out, but in the ensuing weeks he labored with support from Custom Performance Engineering and Revolution Automotive to pilot his EcoBoost Mustang to the first 10-second passes on record. 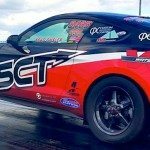 Of course, Brad rushed to get the new combo ready for the EcoBoost Battle at NMRA World Finals in Bowling Green, Kentucky, but that meant time was short. It didn’t help that the weather wreaked havoc on the available track time either. So, after the event Brad and his team set out on a two-week mission to put his turbocharged four-cylinder into the record books again. 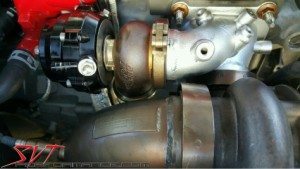 At the suggestion of Adam Marrer of Pops Racing, Brad brought in Adam Browne of Revolution Automotive to help overcome some tuning quirks that he’d been fighting on this somewhat exotic combination that’s still under the sway of a factory PCM. Adam worked up a custom SCT calibration to control the new combo. At this point, that combo includes the aforementioned short-block, a CP-E turbo kit with a much larger turbo and intercooler, plus the first set of Aerospace Components’ new dual-caliper rear brakes, which are crucial to building boost off the starting line. Brad found his groove at Maryland International Raceway. Once the combination came together, his four-cylinder 2015 Mustang ran three 10-second passes in a row—a 10.91, a 10.92, and a 10.91—in less than an hour. Brad has constantly tweaked his EcoBoost combination since he blasted off that low-11-second pass back in March of 2015. Now the car wears a C-PE turbo kit with a larger turbo; an upgraded fuel system including Deatchwerks injectors and a CP-E FuelBAR Kit; and SCT tuning support from Adam Browne at Revolution Automotive. Now time was running short. 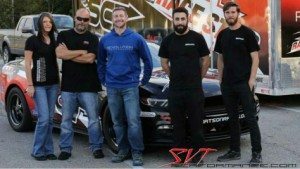 Adam could only afford so much time away from his shop, and Brad had to prep his Mustang for a trip to The SEMA Show in a few weeks. They had one more crack at the record, so the team regrouped for one more day of testing. Check out the sweet, cast manifold adapter that allows the installation of the huge Precision Turbo unit that is the centerpiece of the CP-E turbo upgrade. Brad says there’s a lot left in this combination. Easing into things is not something Brad is known for. He wants to run quickly and he doesn’t want to wait. However, with all the new power capability on board, he is taking a slower steadier pace to putting the power down. Since there isn’t a transbrake option on the latest Mustangs, it can be difficult to build boost at the starting line. 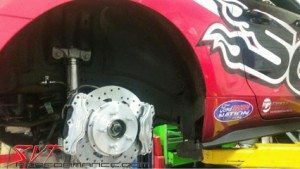 To get the boost up before he launches, Brad uses these dual-caliper rear brakes from Aerospace Components. 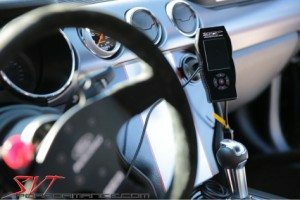 This is the first system of its kind, and Brad requested that Aerospace build this kit so other EcoBoost owners will be able to take advantage of this setup. Of course, this is far from the end of the story on the record-setting BG Racing EcoBoost Mustang. Brad will continue pushing the combination, and with cooler weather upon us, there is no telling how low those e.t.’s could go. Brad is keeping the dyno numbers to himself, but clearly he’s optimistic about the car’s future potential. “Well, we did it! World’s first 10-second EcoBoost! Huge thanks to everyone involved, especially the team at CP-E and Adam at Revolution Auto for the grueling two weeks since Bowling Green,” Brad announced on social media after achieving his goal. “All the sleepless nights and trips to the track were worth it! Thank you to all my sponsors!” In addition to all those sponsors, his direct support at the track came from (from left to right) his wife Nina, Adam Browne of Revolution Automotive along with Mitch Levy and Trip Ulvila from Custom Performance Engineering. • JLT hydrocarbon engine cover, fuse box cover,and radiator cowl.